CRAWFORDSVILLE, Ind. -- A judge has sentenced a central Indiana woman to 120 years in prison for fatally stabbing her young children hours after her husband filed for divorce. Thirty-one-year-old Brandi Worley learned her sentence Monday after she pleaded guilty in January to two counts of murder for killing her son, 7-year-old Tyler Worley, and her daughter, 3-year-old Charlee Worley, in November 2016. Her husband was asleep downstairs at the time at the family's Darlington home, about 40 miles northwest of Indianapolis. Worley gave no statement at the sentencing, and her attorney said there was no explanation for what she did. 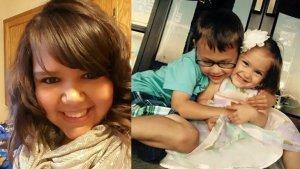 Court documents have said Worley told police she killed the children because she didn't want her husband to take them. She also was treated for self-inflicted stab wounds to her neck. Worley called 911 moments after the attack. "I just stabbed myself and I killed my two children," Worley says calmly in the 911 audio previously obtained by CBS affiliate WTTV. When the dispatcher asked Worley what caused her to do that, she replied, "My husband wanted a divorce and wanted to take my kids. And I don't want him to have my kids."